In celebration of Black History Month Rho Epsilon Zeta chapter participated in the First College/Greek Fair in Roswell, GA. 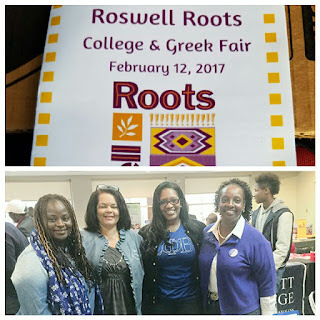 This initiative was a part of the Root Ensemble organization funded by the City of Roswell. We had a chance to meet high school students who were interested in attending college and we provided information about our beautiful Sorority. Most importantly we had the opportunity to provide information about our Louquender Robinson Memorial Scholarship that is awarded to a deserving high school student every sorority year. The event was well attended and the young adults walked away with a wealth of information.